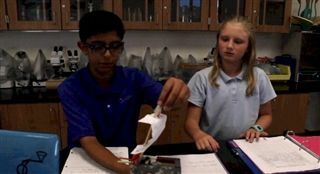 This week, 7th-grade Life Science students followed the design thinking process (empathy, define, prototype, ideate, test) to build boats for Stuart Little, the beloved fictional mouse from the children's book of the same name. Using only recycled materials, students were challenged to develop a prototype and a method of propulsion that would carry the boat two meters down a rain- gutter track. To succeed, groups had to adopt a design thinking mindset that included collaboration, a bias toward action, iteration, and failing fast. Thanks to balloon sails, rubber-band rudders, a bit of ingenuity, and a whole lot of trail and error, students came up with designs that would make any mouse proud. Click here to watch a video of the project.